As the name suggests, RunSQLRun runs SQL statements. It's not a database administration tool, but a tool for developers to execute queries. And while we're at it, it also has no savety belts: Don't try to select a trillion rows. However, it's almost never a good idea. 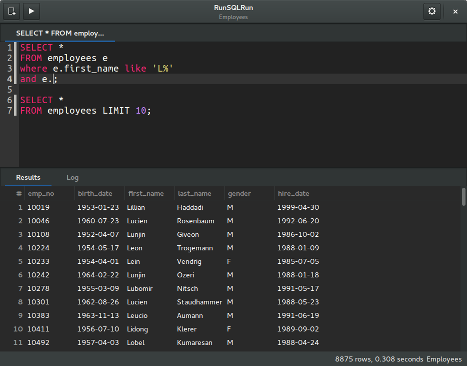 You can use RunSQLRun to run queries against those databases and it'll will assist you with some schema information along the way. RunSQLRun uses GTK as it's GUI toolkit and fits nicely into the GNOME Desktop Environment. It is released under the terms of the MIT license. Happy contributing! For now please follow the README.